← Workshop: Can We Live Free Of Corporate Control? Is The Iowa Utilities Board Working For Big Oil? The Bakken Pipeline fight is heating up, but you can take action today. The Iowa Utilities Board just announced November 12-16 for the Bakken Pipeline evidentiary hearing. This adheres to Dakota Access’ construction timeline, making it clear that the Iowa Utilities Board is working for Big Oil. The Rock Island Army Corps of Engineers, a government agency that is responsible for investigating, developing and maintaining the nation’s water and related environmental resources, is evaluating permits for the proposed Bakken Pipeline under their “Nationwide” permitting process which means they’re just assessing segments, not all of the pipeline. Tell the Army Corps of Engineers to use an “Individual” permit for the entirety of the proposed Bakken Pipeline to assess the impacts from start to finish! The individual permit is more stringent, will require a public comment period and could delay the permitting timeline for 3-5 years. The Army Corps is making their decision on how to assess in the next month. That, along with IUB’s hearing adhering to Dakota Access’ construction timeline, means we need at least 500 folks to take action by mid-October. The pipeline would cross every major waterway in our state, and would cross tiled farmland. An oil spill would impact entire watersheds and spread through tiled land into our rivers and streams. The Army Corps cannot just evaluate segments – they must evaluate the entirety of the proposed Bakken Pipeline! Tell the Army Corps they must assess the entirety of the proposed Bakken Pipeline – our water and land depend on it. This entry was posted in Iowa Globalwarming, Iowa in the News and tagged Bakken pipeline, Iowa oil pipeline. Bookmark the permalink. 1 Response to Is The Iowa Utilities Board Working For Big Oil? 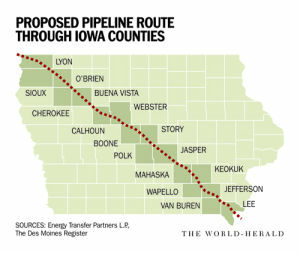 I am strongly against the Bakken Pipeline in Iowa. The pipeline has a history of leaks and spills that endangers the environment of Iowa. The crude is the dirtiest oil on this planet – highly polluted with chemical. I can envision the pipeline leaking oil into our streams and rivers and farm fields. Please stop this potentially hazardous disaster. The Army Corps must assess the entirety of the proposed Bakken Pipeline.